With two national film awards to its name, the official trailer and promo song of Sinjar was released on April 30. 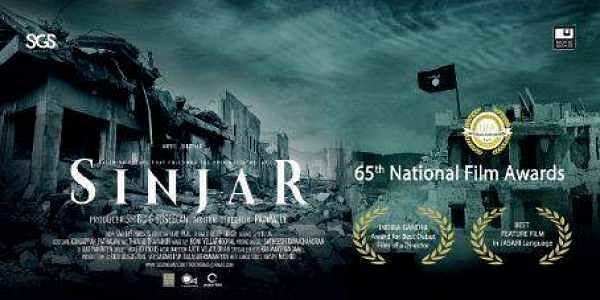 KOCHI: With two national film awards to its name, the official trailer and promo song of Sinjar was released on April 30. Director and writer Sandeep Pampally and producer Shibu G Suseelan hosted the event together at IMA Hall, Kochi.According to both the director and the producer, the film is unique through the place it is set on as well as the language it uses to tell the tale. The tale is based on the events that followed the massacre at Sinjar in 2014, where it follows the characters Suhara and Fida as they escape the clenches of the ISIS terrorists and finds their way back to the protagonist Ansar. It offers both a perspective on international terrorism as well as on the lives of escapees of such experiences. Along with this, the film also features the life of an ordinary man living on the Lakshadweep islands.The film received the Indira Gandhi Award for Best Debut Film of a Director and Best Feature Film in Jasari language. This is also the first film to be scripted and to feature a song in Jasari language. This is the first feature film to be shot entirely on Lakshadweep. The language, as both the producer and director confess, created unique challenges for the making of Sinjar. Jasari, on top of being a colloquial language, shows influences from other languages such as Malayalam, Tamil and Arabic. “However, the language has no script, grammar or even a dialect,” said the director. He used Jasari as he heard it for the script by using Malayalam as the medium. The language, according to the producer, is spoken by almost 80 per cent of the population. However, it is more common among the elderly. This change in language leads the producer to believe Jasari will be on the verge of vanishing from the islands in 15 years. The language also presented the film with challenges while dubbing. The director found dubbing to be the hardest part as he had to screen the movie multiple times to those who spoke Jasari to make sure there were no errors in the language. The producer found it difficult to get the approval of the Censor Board. According to him, the challenge began with the application for the Censor Board review as there was no option for the film to be submitted online under the language of Jasari, which was followed by the lack of a representative on the authority who can review the film.